This brilliantly devised CD from Gerard McChrystal is a deeply personal album; at times mystical, the music is always beautiful and captivating. Indeed ‘Aria’ has similar qualities to Jan Gabarek’s ‘Officium’ (which sold 1.4 million copies) and will appeal to this fan-base. Featuring soprano and alto saxophone with a colourful array of different ensemble accompaniments — string orchestra, choir, guitar, piano, solo, string quartet and electronics. Baroque music blends seamlessly with contemporary; Handel resolves into Michael Nyman, Debussy’s Syrinx morphs into Ravel’s Piece en forme de habanera. All the tracks lead to the next by key or by starting and ending on the same note. Other works include Philip Glass Façades, Faure Les Berceaux, Bozza Aria, as well as original works by Billy Cowie, Karen Tanaka, Andy Scott and Michael McGlynn (from the vocal group Anúna who featured in Riverdance). 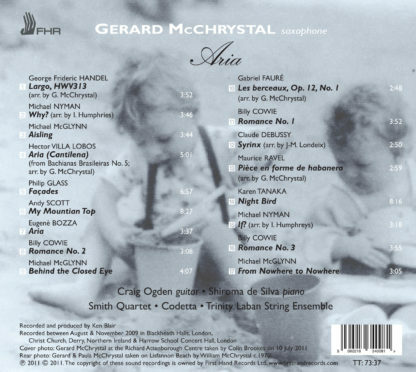 Accompanying Gerard on this album are some of the UK’s finest classical musicians including the Smith Quartet and the No. 1 best-selling classical artist, guitarist Craig Ogden. 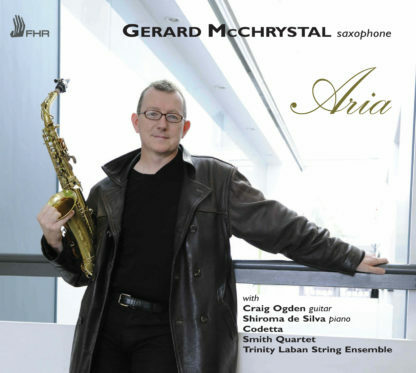 Gerard McChrystal is a multi-award winning saxophonist who has performed as a soloist in over 30 countries with many of the World’s leading orchestras and ensembles.